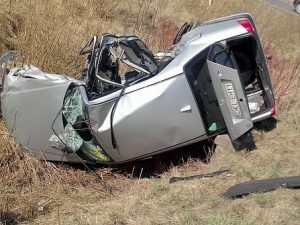 A crash on Route 6 this afternoon in Dennis, Massachusetts has left one-person suffering from life-threatening injuries. A Ford F-150 was traveling westbound on Route 6, near exit 9 and the Bass River. Officials with the Dennis Fire Department say that the truck was pulling a boat at the time. Suddenly, the truck was cut off by another vehicle attempting to merge into its lane. As the driver swerved to avoid hitting the other vehicle, they lost control of the truck and the truck flipped over several times. One of the injured victims in the truck was trapped underneath the vehicle for several minutes as emergency rescue workers tried to free him. Emergency personnel from Yarmouth had to use lifting air bags to remove the man from the truck while also utilizing a chain saw to cut trees off of the truck’s door. Both injured men were taken to Cape Cod Hospital, where one has what are described as life-threatening injuries. Traffic backed up for several miles due to the accident and was down to one lane for over an hour as officials worked the crash. Massachusetts State Police are still investigating the crash. No one has been charged at this time. We are saddened to hear of this injury accident in Dennis. Every day, in our law practice we deal with all types of accident victims, whose injuries range from soft tissue, up to catastrophic and permanent. Car accidents are difficult for all involved and there are simply no easy solutions when you or a loved one has been injured unexpectedly in a crash. The aftermath is as bad or worse than the accident itself. While most people fortunately survive the initial accident, they can be left with a mountain of problems afterwards. Dealing with insurance companies to receive reimbursement for property damage and injuries can be overwhelming to many accident victims without the aid of a good personal injury attorney. In these times, you need a strong advocate who can fight for you to ensure that your legal rights are protected and that the insurance company is forced to offer a fair resolution to your case. At the Law Offices of Jeffrey S. Glassman, our team helps injured accident victims and loved ones of accident victims who have been hurt in crashes. We take a compassionate, yet tough and experienced approach to handling our clients’ cases. Our goal is to get the results you deserve. For a free consultation with one of our attorneys, give us a call today at 617-367-2900.